I asked Marty to be more specific about how we got outside our process, and he told me that we didn’t really. His concern was that we were getting a lot of unsolicited “help” from the White House and OSTP in determining the protective action recommendations. He suspects in a domestic situation, we would probably get even more “help,” and it’s something we should be prepared to deal with. We should add this to the lessons learned effort. Dan … thanks … can you be a tad more specific about how Marty thinks we got “outside our existing framework” in decision-making? I have some thoughts on this, but I just want to be certain that we understand Marty’s specific concerns. Jim, I met with Marty this morning, and he had two things for NSIR. He would like to have the information paper to the Commission done as soon as possible. He mentioned taking it to the April 2 1st meeting with EPA, but I’m not sure that’s realistic. 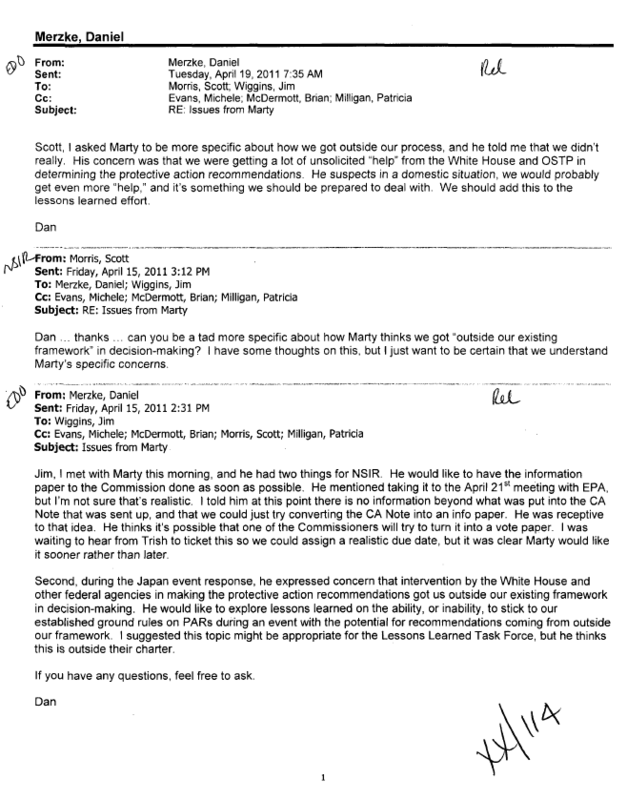 I told him at this point there is no information beyond what was put into the CA Note that was sent up, and that we could just try converting the CA Note into an info paper. He was receptive to that idea. He thinks it’s possible that one of the Commissioners will try to turn it into a vote paper. I was waiting to hear from Trish to ticket this so we could assign a realistic due date, but it was clear Marty would like it sooner rather than later. Second, during the Japan event response, he expressed concern that intervention by the White House and other federal agencies in making the protective action recommendations got us outside our existing framework in decision-making. He would like to explore lessons learned on the ability, or inability, to stick to our established ground rules on PARs during an event with the potential for recommendations coming from outside our framework. I suggested this topic might be appropriate for the Lessons Learned Task Force, but he thinks this is outside their charter.